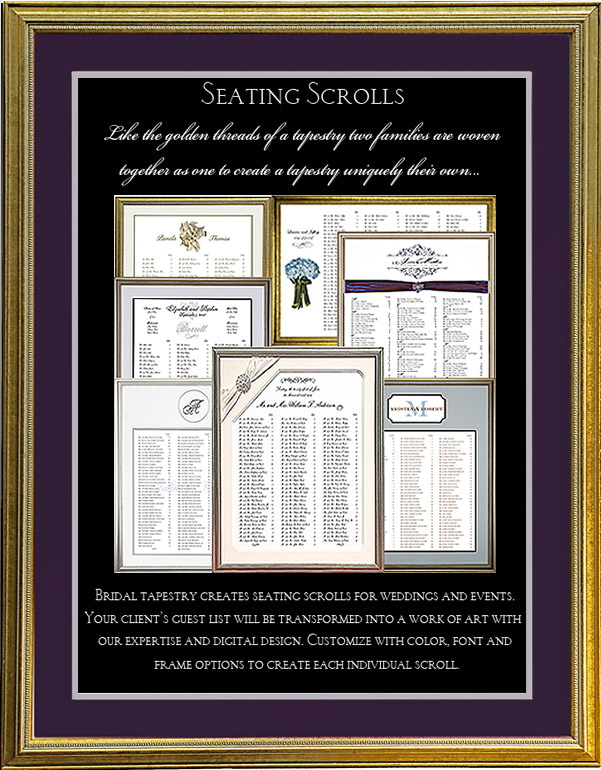 Bridal Tapestry creates seating scrolls for weddings and events. Customize with color, calligraphy fonts , frames and mats to create each individual scroll. Allure - For the bride who wants that clean modern look with a slight traditional twist. A raised initial monogram embellished with Swarovski crystals. Opulence - For the classic traditional bride who wants the ultimate in sophistication. A pure silk matte, rosette brooch adorned with Swarovski crystals and a luxurious ribbon. Arabesque - Classic and sophisticated. Luxurious purple ribbon and a vintage brooch.